Imagine if as you traveled through the city, you could hear some of its stories? Imagine if this were in L.A., a supposed non-city, where most people who can afford it travel the freeways until spit out at their destination. Airless, scentless, cocooned with their own personal car soundtrack from Spotify, stacks of (unlabelled) CDs, or the radio. Alternatively, one could bike to the sounds of car engines–even while blasting an iPhone or MP3 player. In conjunction with the first biennial of Made in L.A., multi-museum and gallery exhibition of upcoming and emerging local artists, the Hammer Museum produced a (free) app for that. One’s location will trigger site-specific stories and snippets of interviews of participating artists and curators in the biennial. In between the various points, local music selected by LA DJ collective and online “future. roots. radio” Dublab streams. I really love this idea. And look forward to listening to the city in a new way. 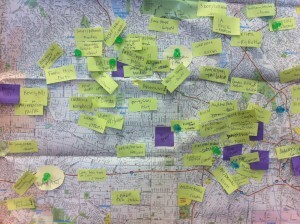 This entry was posted in Los Angeles, mobile phones and tagged art, museums, soundmaps. Bookmark the permalink.